Are there capacitors or resistors involved? How do LED light bulbs work? mentions the presence of a heat sink, which these bulbs do not have. These bulbs also seem to have no space for electronic components. 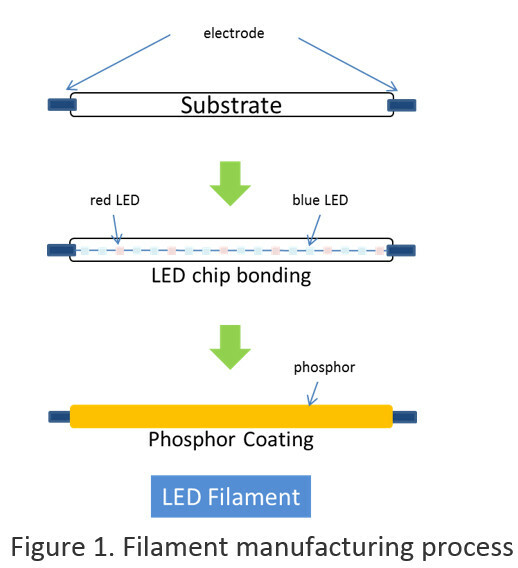 The LED filament is composed of a series of LEDs on a transparent substrate, referred to as Chip-On-Glass (COG). These transparent substrates are made of glass or sapphire materials. This transparency allows the emitted light to disperse evenly and uniformly without any interference. An even coating of phosphor in a silicone resin binder material converts the blue light generated by the LEDs into a mixture of red, blue, and green light to create a specified light temperature. Degradation of silicone binder, and leakage of blue light are design issues in LED filament lights. Positive benefits of the LED design are potential higher efficiencies by the use of more LED emitters from lower driving currents – major benefit of the design is the ease with which near full 'global' illumination can be obtained from arrays of filaments. It's difficult to say how many LEDs are involved but if they are 3 volt LEDs and the mains is rectified and smoothed from 230 VAC to 324 V DC then 100 or so of these substrated LEDs might be used and also a current limiting resistor or transistor circuit. It could be as simple as a bridge rectifier, smoothing capacitor and a linear current regulator with all the LEDs in series. Not the answer you're looking for? Browse other questions tagged led capacitor resistors mains or ask your own question. How do filament LED bulbs work, looking very similar to incandescent bulbs? Touch dimmer with low voltage transformers, needs incandescent to work? Updated! How to build a continuous LED bar? Will “dimmable” 120VAC LED bulbs work on half-wave-rectified power? How does ground mains work? LED filament bulbs without an envelope?